If this spice had a less cumbersome name—say methi, its common commercial name (and what it’s called in India)—it might be better known and more popular in the Western world; as it is, it’s a rare curiosity, which is a shame. Fenugreek also has beneficial effects in reducing the effective glycemic index of other foods, and even in lowering cholesterol [Click through the disclaimer to read the article.]. 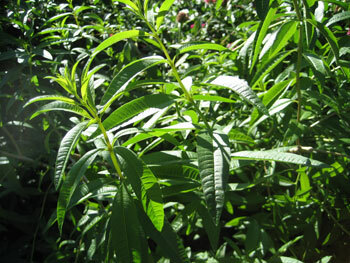 As with many herbs, lore ascribes many other potencies to it; a commonly believed one is that it augments lactation in nursing mothers. If fenugreek seed is sown in boxes [planters] and grown to the two-leaf (cotyledon) stage like mustard and cress, it makes a five-star salad when dressed with oil and vinegar. The taste is refreshing, new and unusual. Stobart notes, though, that mature fenugreek greens are quite bitter—but says that curried, even they make a satisfactory dish. It must prove something that there are numerous well-known cultivars of fenugreek in use in the extensive commercial trade, but no named varieties whatever (that we could find) in the home-garden seed catalogues; few enough carry even a generic “fenugreek“. 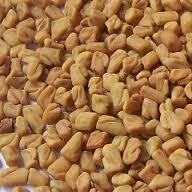 Fenugreek likes warmth: its growth is slow and weak in cold temperatures or wet soils. Since it supposedly bolts to seed quickly and easily, we might as well plant it out when the weather has gotten good and warm, say middle May, or even June 1st. The general rule for herb and spice plants is that their soil needs are not demanding, save that the soil must be very well-drained: few herb or spice plants can stand “wet feet“. The soil should not be particularly rich, most especially not for flavoring plants we grow for their seed (or fruit), common mis-advice to the contrary notwithstanding: a rich soil will lower the concentration of the “aromatic oils“ that give the seed its characteristic flavor, which is the very thing we are growing them for. Plants that are slightly nutrient-stressed (which doesn’t mean starved) give better-tasting seed. Fenugreek is typical of that description. Curiously, fenugreek is a legume; it will thus enrich the soil where it is grown, but that also means it’s wise to use inoculant (of the usual pean-and-bean sort) on it when seeding. Plant seed where the plants are to grow; seed about 3/4" deep. Some sources recommend pre-soaking the seeds in warm water for half a day or so. Spacing is unclear, but apparently it is usually grown closely—at 2 to 4 inches apart. The seeds—brownish, about 1/8 inch long, oblong, rhomboidal, with a deep furrow dividing them into two unequal lobes—are contained, 10 to 20 together, in long, narrow, sickle-like pods, which do not naturally shatter. Fenugreek plants may thus be left to dry down, then harvested. The seeds, like most spice seeds, need to be very well dried, but never with any sort of warm-air or forced drying, lest they lose some essential oils. You loaded this page on Friday, 19 April 2019, at 17:14 EDT. It was last modified on Monday, 4 February 2019, at 03:30 EST.